Many thanks to Simon Flynn for the videos. Outside the weather was beautiful with cool Spring breezes tossing the daffodils; but few of the twenty-plus contestants had time to sit in the artfully placed deck-chairs on the Seacourt decking, even when not on court. 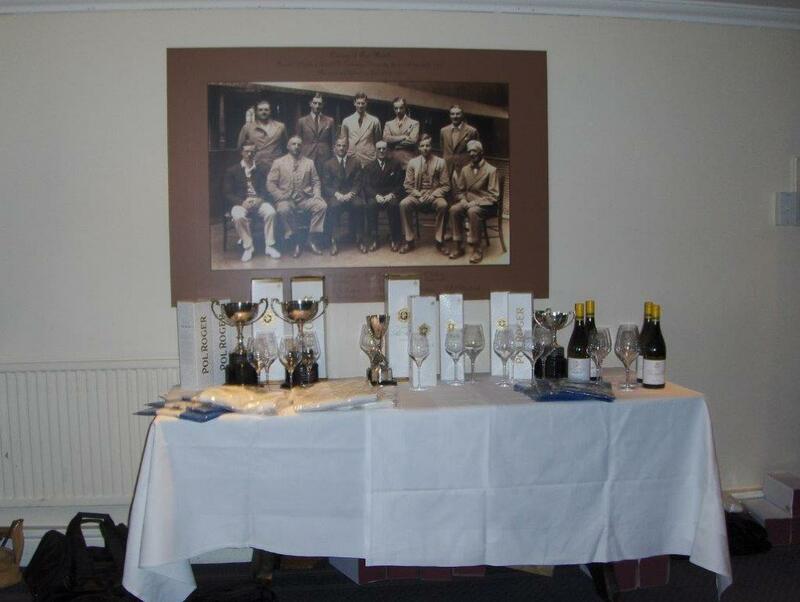 Maybe the well-stocked bar proved too enticing an alternative. Or maybe the exciting tennis? 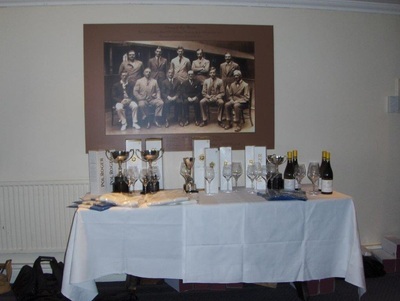 It was certainly pleasant for those from less well-stocked Clubs to order delicious hot snacks and drinks and, of course, dinner on Saturday night was equally memorable – though the High Sheriff of Cambridgeshire disappointed some by leaving her sword at home. 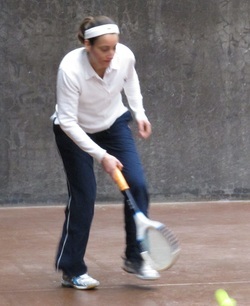 But on to the tennis…. Interestingly, there was only one match that went the full course of 3 sets, and that was in the Singles Plate. But that didn’t mean the games were dull – whatever the difference in standard, contestants gave it their all and spectators had more than their money’s worth. Those who knew themselves to be cannon fodder were quickly disposed of in the first round. Lucy Hutchinson put up a good fight against the elegant Nicola Doble, a leftie who plays a great length of shot and seems able to hit a whacker or a subtle drop with equal ease. Lucy picked up some very tricky serves and quite often tempted errors from Nicola as she clung to the rests, but couldn’t counter the power. Nicola through, 6/1 6/1. Similarly, Linda Fairbrother did her best against Freddy Adam and capitalized on a tentative start by Freddy to stay level with her up to 3 all in the first set. She nearly went ahead to 4/3, but Freddy then began to use her skills, and allowed Linda no more consolation. Freddy through, 6/3 6/0. The final game of the first round was a far more intriguing contest, between the two young players Jess Garside and Harriet Ingham. Jess’s bright pink shoes were much in evidence as she flew around the court, trying to find a way to break Harriet’s steady clever play. They played a similar style of game, which led to exciting long rests, with both fighting like tigers to stay in the point. But Harriet was winning the games, and she took the match with a score that didn’t do justice to the contest: 6/2 6/2. 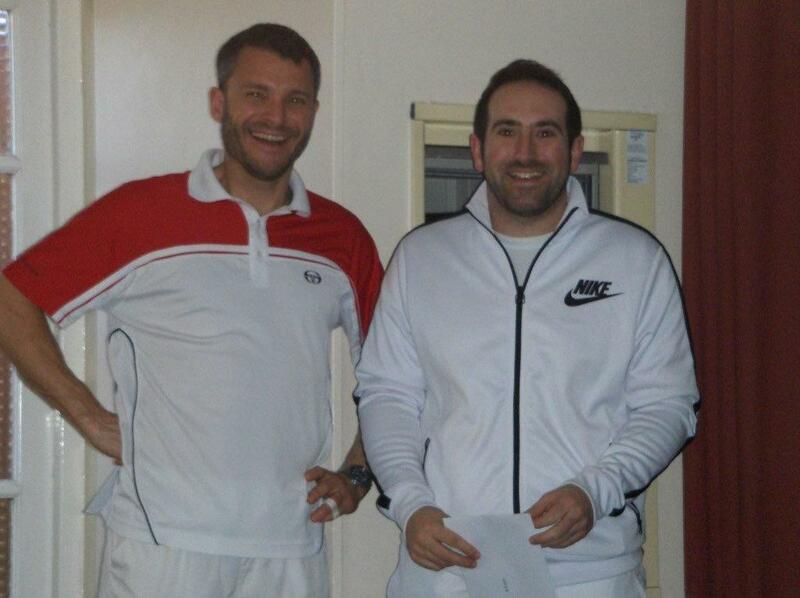 The seeded players arrived in the second round. First up was Alex Garside against Nicola. A nervy start by Alex allowed Nicola to get into her stride and take the first two games. Things then steadied, but the confidence boost seemed to support Nicola through the first set, even though Alex levelled up using superb sidewall forces and ground strokes into the corners. It was neck and neck, with Nicola using her long legs and reach to run across from side to side, and Alex not playing 100 per cent her best, with errors at crucial moments. Nicola took the set 6/5. As one would expect, Alex came out fighting at the start of the second and stayed a game ahead up to 4 all. Every point was contested fiercely and, by this stage, Alex was perhaps looking a bit weary though more or less in control. But after another punishing game with three deuces, Nicola went ahead for the first time in this set and at 40/30 in the next game, managed to stretch Alex a touch too far to put her return into the net. Nicola’s face as she won the set and the match was a picture of disbelief: 6/5 6/4. Freddy came up against Sue Haswell, a contest anticipated in the dedans as power versus elegance. It was certainly an exciting match, with rests lasting 18 or 20 strokes, numerous deuce points and fast and furious retrieving from both players. In the first set, Freddy was great at anticipating where the balls were going, but then tended to make unforced errors when hitting them. Sue just had to keep in the picture to take the games, which she did, to win the first set 6/2. The second set began with a spectacular rest of 21 strokes. 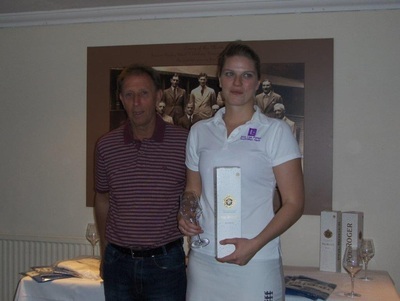 Freddy was firing better and making fewer errors and looked set for a comeback as she went ahead 2/0. Sue was now the one putting the ball in the net and shrugging her shoulders in frustration. But Freddy began to misfire her volleys, so that for every two great shots, there would be one disastrous error. 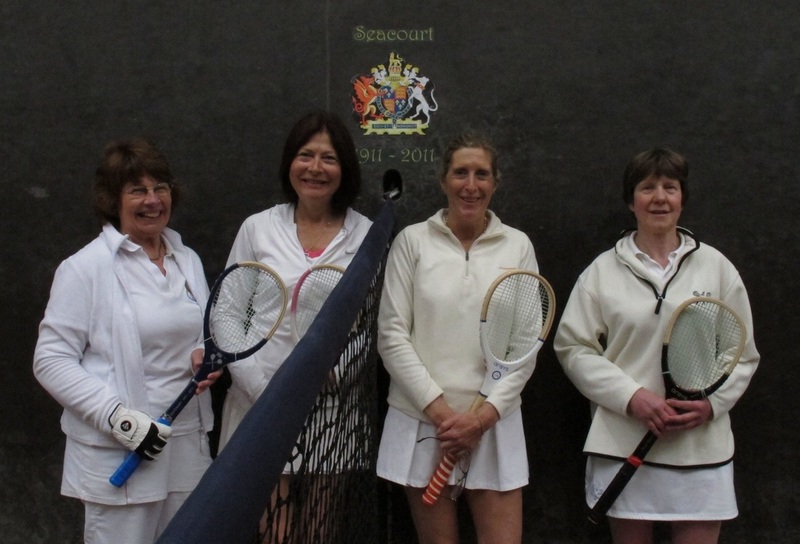 Though play continued fast and furious, with volleys, half volleys and forces intercepted superbly by both, Sue was able to bring off the vital points and crept ahead. It was all over with, yes, another smash volley into the base of the net by Freddy. Sue wins 6/2 6/3. As a reward to her excellent win against Jess, Harriet Ingham found herself playing the second seed, Sarah Vigrass, in the final match of the second round. She gave it her best shot, playing strong, clean strokes, defending well and never giving up. There were some very good rests, but inevitably Sarah was too strong and too experienced for Harriet, and won 6/1 6/0. But Harriet certainly made her mark in her first Open and is clearly a star of the future. In the semi-finals, Sarah Vigrass met Sue Haswell in a delightful game where the score didn’t do justice to the closeness of the play. The first game said it all – it lasted nearly 10 minutes before Sarah finally won. In the following game, Sue put together beautiful tactical sequences, but just lost nearly all the game points; it must have been heart-breaking. Three or four times she had to attack a very good chase and would send down what should surely be an absolute winner, but somehow Sarah picked up balls from half an inch above the floor, to make Sue have to do it all over again. Sarah took the first set 6/2. The second set began like the first, with a marathon game, though only about 7 minutes this time, again won by Sarah. 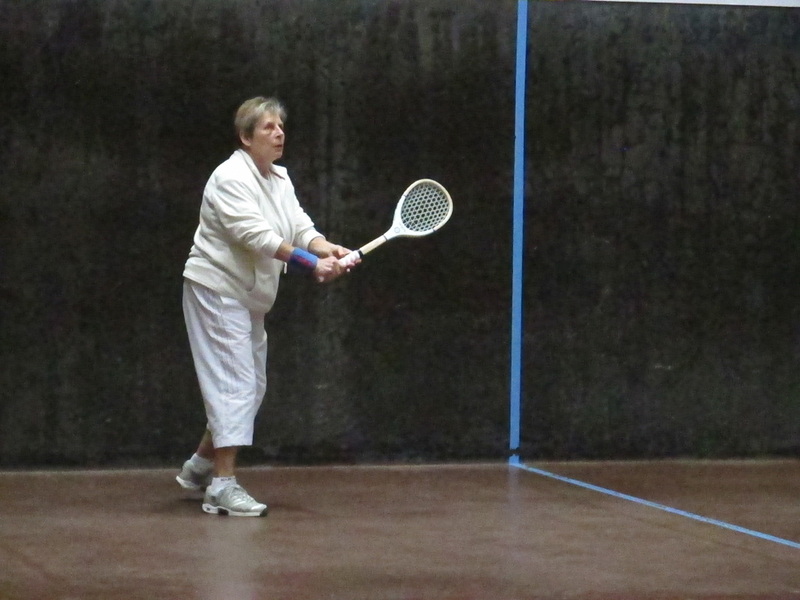 Sue continued to fight all the way, volleying into corners, attacking the serve, firing shots at Sarah’s feet. She was winning many points but couldn’t take enough games. Sarah wins the match, 6/2 6/2. In the other semi, Claire Vigrass took on Nicola Doble. Nicola was apparently unfazed by her position and continued to play her elegant game, picking up shots well and returning in the rests, but not with the same penetration as Claire. The first set passed quickly, 6/1 to Claire. In the second, there were some great rests, with Nicola going for the tambour and reading the ball really well. But of course back it always came, and Nicola couldn’t find a way to do any damage to Claire or put pressure on her. But she kept trying and was getting plenty of points. At 5/0, Claire at the service end put up a high ball that bounced on the Hazard penthouse and then came round to die on the side wall right at the corner of the tambour. An amazing shot, and it was all over, 6/1 6/0. In the Single Finals, as expected, the Vigrasses met each other once again. Sun delayed play, as Sarah at the Hazard end decided she needed a hat to shield her from the spring sunshine beaming down on the receiver. A visor was brought and rejected; a pair of very natty white sunglasses were brought and rejected. Finally a hat was conjured up from somewhere and accepted. While this was going on, Claire was obviously working on the implications of her sister’s worries. She was having a nice little lob practice, trying to work out exactly the angle of the sun’s glare, in the hope presumably that the hat would not do its job. Play began. No lobbing required for the first game, which Claire took in short order to love. Three more games followed, but both were now turning up the heat control, with volleys, tambours, full stretch ground strokes inches off the floor. But Sarah was still not getting the consistency, until she finally got on the scoreboard to make it 1/4. Apparently energized by this, the two players began to play for real. This was Tennis, Jim, but not as we in the dedans know it. The pick-ups by Sarah were amazing – from the tambour, from the corners – as Claire hurled missiles at her. But Claire always had one more shot, and got the score to 5/1. Sarah managed to win the next game with a beautiful attack on Chase 2 and 3 into the forehand corner. But then Claire took the set with clinical efficiency in another love game, 6/2. In the second set, Sarah tried some new tactics, sending awkward angles at Claire, and this produced results. 2/2, and then 3/2 to Sarah, as Claire reacted to the extra pressure with mistakes. 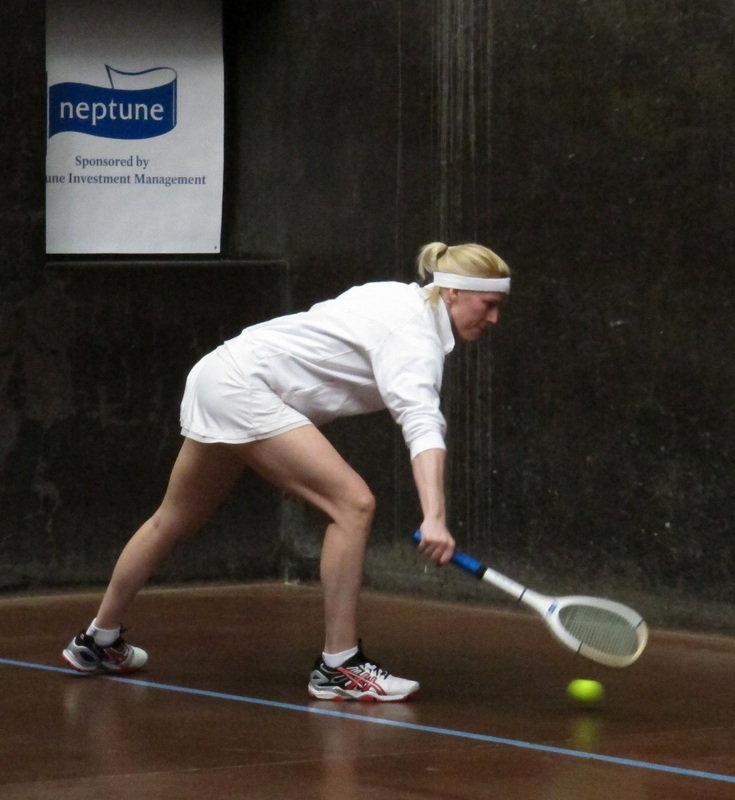 But then she stopped the momentum, with some awesome rests, where both players were volleying off the tambour, cutting fiercely into corners, running like Usain Bolt to retrieve – fantastic stuff! Claire moved ahead whatever Sarah did. At 5/3, 30 all, Claire forced to the grille, then in the final shot made a subtle hit from the service end that ricocheted under the grille to fox Sarah completely. 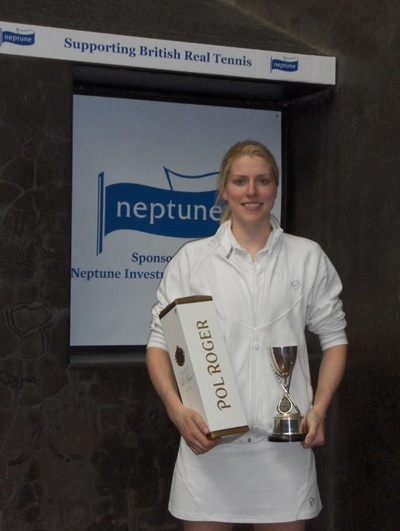 Claire wins yet again, to keep her Open title, 6/2 6/3, in a very entertaining exhibition of how to play Real Tennis. Six pairs contested the Doubles competition and the first round went very much as expected. 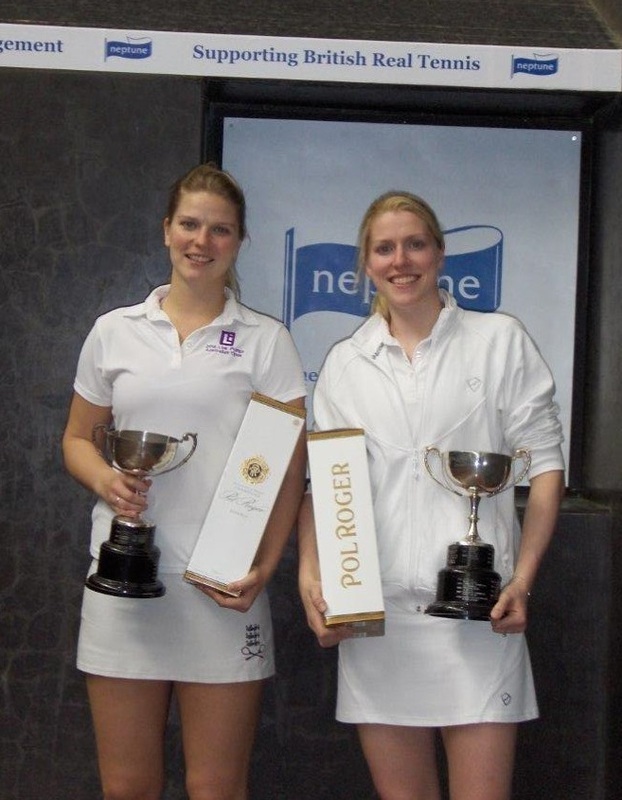 Nicola Doble and Alex Brodie were just too consistent and strong for Doris Oldland and Linda Ford. The nearest the latter got to a game was 40/15, but Nicola and Alex clawed their way back to win that game and took the match 6/0 6/0. Against mother and daughter Alex and Jess Garside, Carolyn Armstrong-Smith and Lucy Hutchinson didn’t have the firepower to do any damage. The Garsides were too strong and accurate and also won 6/0 6/0. In the semi finals Nicola and Alex were up against the Vigrasses and could do little to harm the sisters, though they did win quite a few points. Nicola managed to win one game in the first set, with a great shot into the Winning Gallery, but that was it. Claire and Sarah were just too strong. 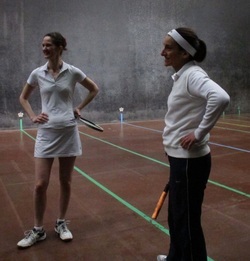 In the rough and tumble of doubles, Nicola was making more mistakes than in her singles matches and Alex was struggling even to get the ball back over the net – though that was hardly surprising, as she was standing forward at the galleries and trying to volley cannon balls. At 5/0 in the second set, Nicola and Alex fought hard to get to deuce, but it only delayed matters, and Claire and Sarah sailed through, 6/0 6/0. As one would expect, the other semi final was a closer contest between Alex and Jess Garside against Freddy Adam and Sue Haswell. Alex began the match in fine style with a shot into the grille, followed at the next point by a superb volley from Jess, standing at the First Gallery, right at Freddy’s feet. They took that first game and all looked set for a fine match. Which it was, though Freddy and Sue began to pull away, with Freddy in particular doing a lot of damage with her accurate volleying from mid-court, having left behind the errors she had made in her Singles match. They took the first set 6/2 and then continued to pepper the Garsides with powerful cut shots and volleys into the second set. 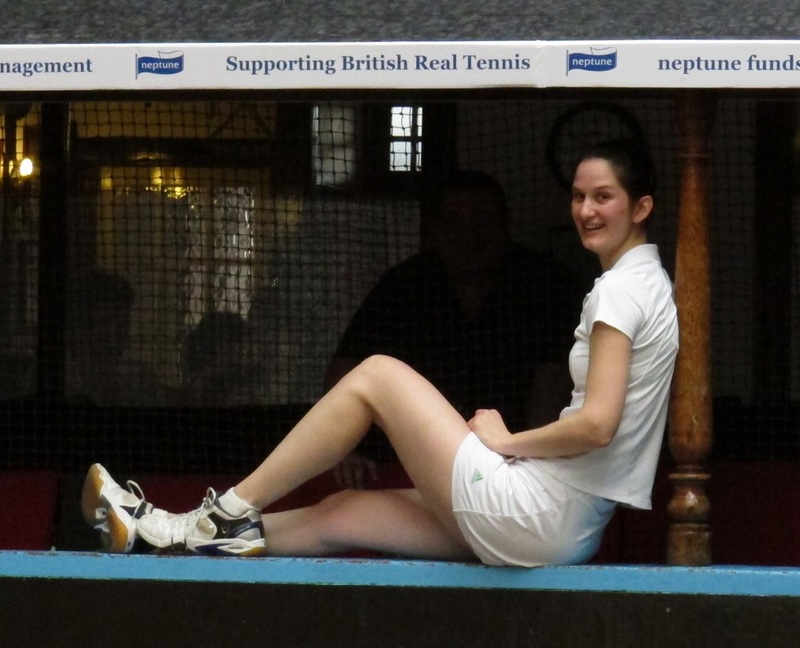 Jess stayed very consistent throughout and looked less tentative than she had in her Singles, while Alex tried to use the corners and tambour to put pressure on their opponents. Point scores were just about equal in this set, but Freddy and Sue were winning the games, and took the match 6/2 6/3. In the Doubles Final, there was some excellent doubles tennis with all four players retrieving, volleying, and playing ground strokes that had the dedans in awe. Although the final score was 6/0 6/1, the Vigrasses had to work hard to retain their championship title. But they were just too consistently powerful and accurate for Sue Haswell and Freddy Adam, who fought every point as hard as they could. It was a splendid match on which to end the tournament on Sunday late afternoon. At last! A three set match! Linda Fairbrother and Lucy Hutchinson, with very similar handicaps, had a very close match, with both playing their best, in the Singles Plate. Lucy came out solid and strong and made the most of Linda’s somewhat nervous start to go ahead 4/1. But once steadied, Linda got her corner shots working and leveled to 4 all. Then battle began. From then on the two fiercely contested every point. Lucy managed to hang on to take the first set, 6/5. In the second set, all was level at 3 all as both refused to give in. One rest in particular lasted about 18 strokes till Lucy smacked the ball just below the top of the net. 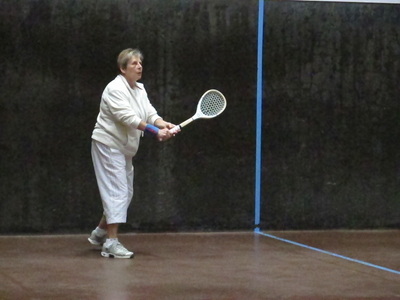 Both were playing low strong shots for the corners, but Linda was using the tambour more effectively and she drew ahead to take the second set. Then her serving began to be more effective and with that tiny bit of extra edge, she managed to stay ahead to take the third set and the match, 5/6 6/3 6/3. 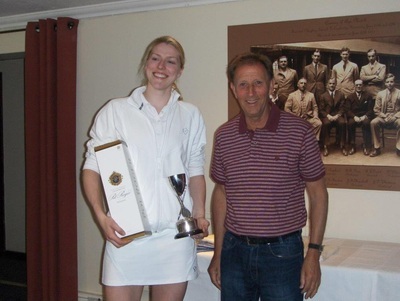 Her reward was a Singles Plate final with Jess Garside, who seemed very determined to avenge her defeat by Harriet Ingham in the first round. Linda managed to get the first game when Jess plopped 2 shots into the net. And keeping the ball low, to prevent Jess from utilizing her formidable volleying skill, she managed to be game point up a number of times. But once Jess settled, she swung the ball in all directions and always had one more shot in her repertoire to finish off the points. Jess wins the Plate Singles, 6/1 6/0. 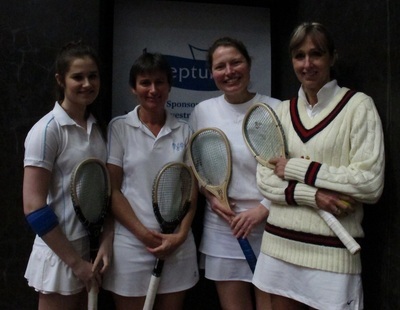 In the Doubles Plate final, Lucy Hutchinson and Carolyn Armstrong-Smith took on Linda Ford and Doris Oldland. Considering that Doris and Linda were getting huge numbers of points in the Handicap competition, they were playing superbly to keep up in this level match. They kept the rests going, moved Lucy and Carolyn around and Doris in particular played far too many dedans shots for someone of her – supposed – ability. 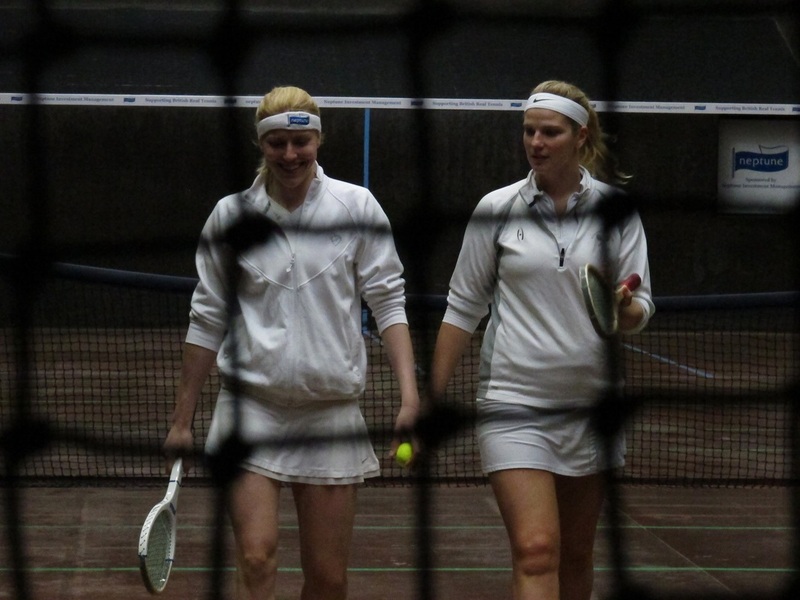 The first set 6/2 score against them was unfair to their efforts, though Lucy and Carolyn coped very well psychologically against opponents who were playing way above their handicap. In the second set, Carolyn and Lucy went ahead 3/1. Doris then played three great serves in a row, to be 40/0 up. She couldn’t manage four in a row, but made up for it by another stinker the next point but one, so it was now 2/3. Lucy and Carolyn were still playing rather tentatively, as if in a handicap match and just not attacking with their shots. But the games were going their way, and with a final game that had five deuces, they took the match, 6/2 6/2. Some of the usual suspects emerged to play in the Doubles Handicap, which took place alongside the Open tournament. And some duplicated themselves to play in both. Eight pairs took part, starting with two round robin groups, with winner and runner-up going through to the knockout stage. Matches were first to six. In group 1, the two pairs to watch were Nicola Doble with Alex Brodie, and Garsides Jess and Alex, both pairs with low handicap. Also in the group, handy players Lucy Hutchinson and Carolyn Armstrong-Smith, with the potential jokers in the pack sitting on a large number of points being local players Fran Syson and Sue Newsom. None of the matches were push-overs; all pairs won at least one match, and three of the four were within two points of each other. But the ‘best’ pairs scraped through despite some very big handicap differences and spirited opposition: Nicola and Alex as winners, the Garsides as runners-up, and Lucy and Carolyn just pipped by one game. In Group 2, the handicap differences were not so large, with Patsy Danby and Jackie Carter having a very similar handicap to Linda Fairbrother and Pam Tomalin; while Doris Oldland with Linda Ford and Sarah McGivern with Sue Bicheno also only had a few points between them. 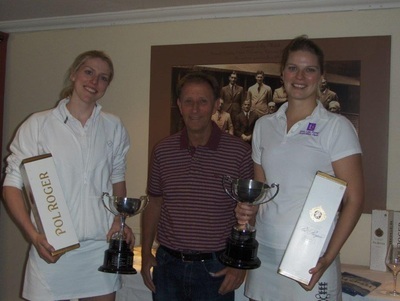 Doris and Linda Ford swept all before them, winning their three matches, each time coming up the finishing strait from behind and using their handicap to great advantage. 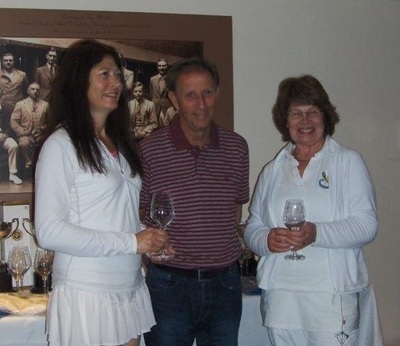 Their closest match was against Pam and Linda Fairbrother, which went to 5 all, 40 all before Fairbrother put a spinning mid-court shot into the net instead of the tambour she’d intended. 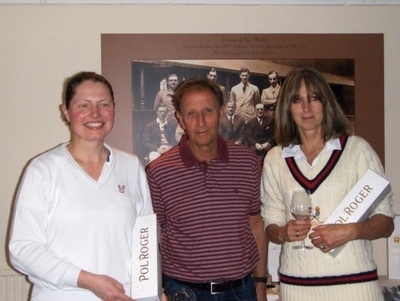 However, Pam and Linda won their other two matches comfortably to go through as runners-up. 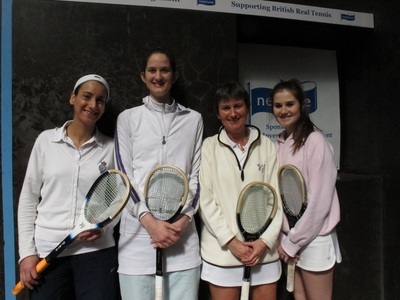 In the semi-finals, (played first to eight) Pam and Linda met Nicola and Alex, in a nail-biting match. Pam and Linda won the first game and then their opponents romped ahead to 7/1. It looked all over, but then Pam and Linda finally found their confidence, hit harder and truer and began to use the handicap of Rec half 30/Owe half 30 in their favour. They threaded the ball down the sides and powered it down the middle - to the confusion of Nicola and Alex - and the games began to go their way, right up to 7 all. Inevitably, it was 40 all, match point. Pam went for broke on her return of serve, but the ball found the net instead of whistling down the middle. 8/7 to Nicola and Alex. In the second semi-final, the handicap difference between the pairs was even greater. 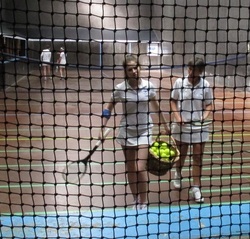 Alex and Jess Garside were on One serve, Banned the tambour, with Rec30/Owe 30. Games could be lost in less than a minute, or won point by laborious point. Every time Alex lined up for a shot from the service end, Jess could be heard sharply reminding her mother: ‘No tambour!’ Alex took the advice each time. But when she tried the same admonition to her daughter, Jess promptly put the ball in the net, so Alex wisely kept her mouth shut after that. 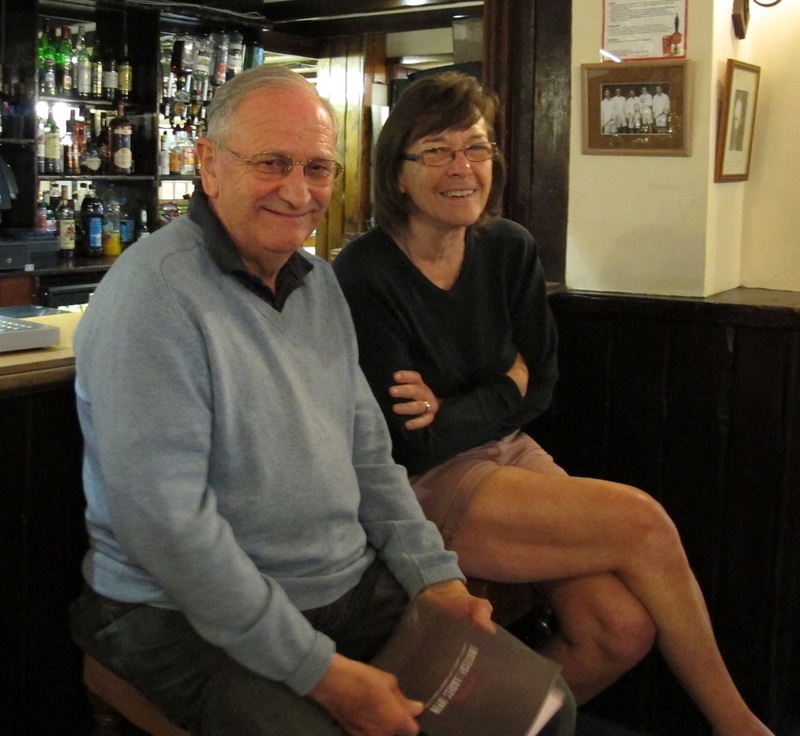 The Garsides played a cautious game without much power, but it did the job, even with the occasional ‘single’ serve fault and even with both of them finding the tambour once, with resultant dark looks from partner. 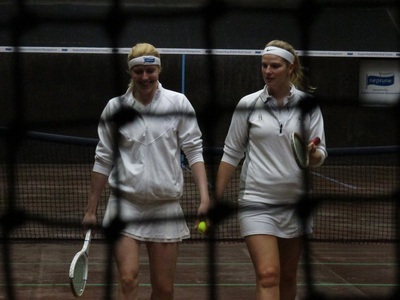 Doris and Linda played superbly and anything less than a good length shot into a corner was coming back. One rest in particular showed how stout resistance can win the point – Doris and Linda were attacking Chase 5 and 6, with a succession of looping shots to Alex that were falling well within the chase. Again and again, they did it, till finally Alex cracked under the psychological pressure and put her ball in the rafters. But the Garsides stayed ahead in game score and at 7/5 put together a string of winners: a good bobble from Alex, then a shot up the tambour side that just slid past the edge (all smiles this time between her and Jess), finishing the game and the match with a put-away by Jess into a corner, to win 8/5. In the final, the two strong pairs – Doble and Brodie, Alex and Jess Garside – met with just 2 handicap points separating them. This was a great match, going all the way, with the initiative swinging first one way and then the other. At first the Garsides seemed in control, going ahead 3/1. But then curlie-wurlies came their way one shot in three, making it difficult to keep the ball low. At 3 all, a winning gallery from Nicola, followed by a shot that just missed the tambour, gave her and Alex B the lead for the first time. This seemed to rattle Alex G and Jess, who made a few errors, tempted, or possibly flummoxed, by Alex B’s style of play which doesn’t do subtle, so either thumps into the dedans or bounces yards high on a penthouse. Nicola and Alex B consolidated the lead to 5/3 and then 6/3. They were playing very well as a partnership, varying their shots so their opponents couldn’t find a rhythm. But then the Garsides settled down to business. At last, the tactic of peppering Alex B when standing at the grille or by 1st Gallery, began to pay off. They levelled to 6 all, and then 7/6. Nicola fought back with three beautifully crafted shots as Alex and Jess overhit somewhat in their desire to finish the match. 7 all. At 30/40 in favour of Alex and Jess, all the players thought a low shot into the corner was a stroke and began to walk to the net to shake hands. But the marker called it as Chase 3, so the excitement continued as they changed ends. Nicola attacked the chase beautifully four times, forcing Alex G to return the ball, till on the fifth attempt finally she lost it – worse than 3. What a finish! 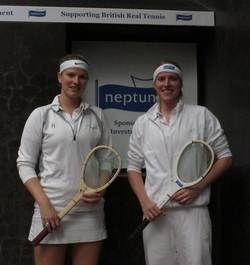 Alex and Jess Garside win by a whisker, 8/7. It was a great tournament, played with spirit, good fellowship and loads of atmosphere. 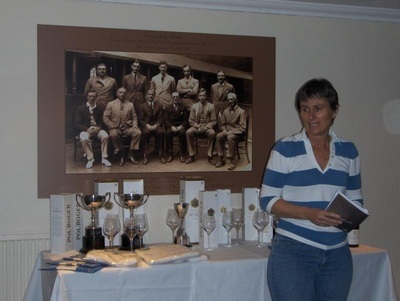 Our thanks to the tournament organisers: Viv Dawes, Alex Garside and Lucy Hutchinson, along with the professionals Dan Jones and Adam Player, who also did the marking. 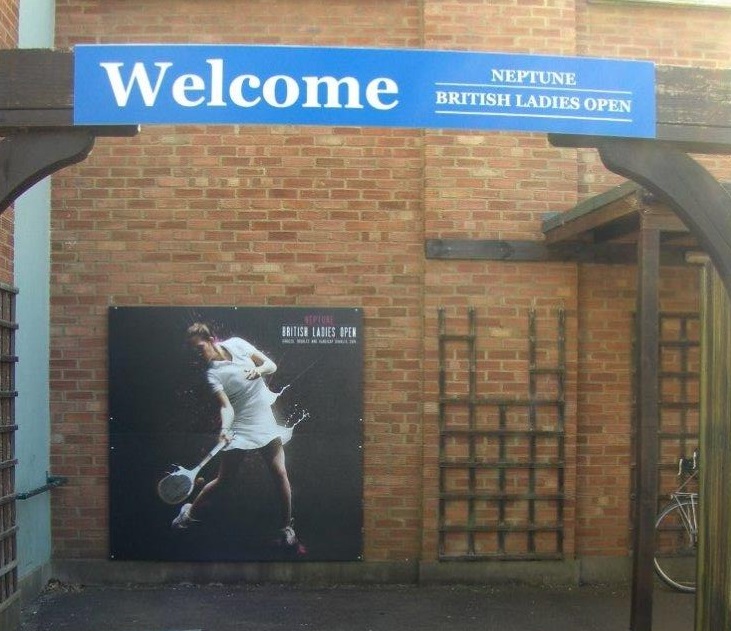 The Sponsors, Neptune Investment Management, are to be congratulated not just for their invaluable help but also for the decoration of the court and surroundings, including even the bandeau and the deckchairs…. 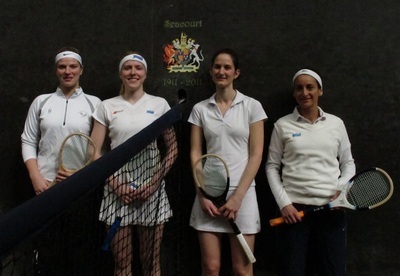 Many thanks to Linda Fairbrother for the comprehensive report, the majority of the "during play" photos and to Simon Flynn for some of those of the action on court.